At Dodd & Co, we pride ourselves on the range and quality of our work. 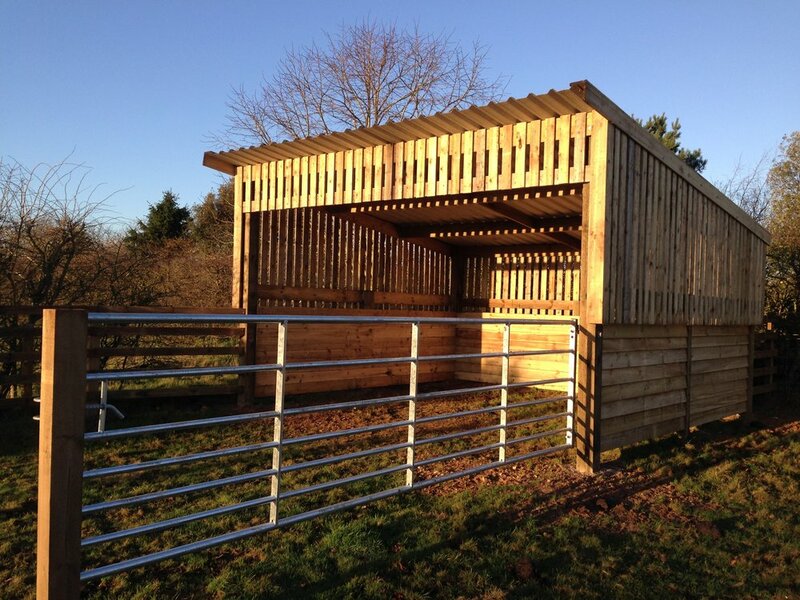 While we remain best known for the high quality fencing that we provide, we also design and build agricultural and equine constructions – stables, tack rooms, cattle sheds – and a range of domestic buildings such as studios, garages, extensions and decking areas. Of late, we have also been commissioned to build high-end dog kennels. Here is a little about each area of work. Fencing and gates that both serve the purpose and look good. We have a huge amount of experience when it comes to fencing. This is borne of our own agricultural and equine background but also from talking to and understanding the clients’ needs. There is no one-size-fits all and what might work to keep badgers out or horses in for one person might require a totally different solution for another client. Our recent fencing projects have included an industrial site, which called for robust secure metal fencing; a deer park, with the main requirement being height to stop the deer jumping the fences; and a garden project which called for clean lines and an aesthetic consideration. While much of our fencing work is for private owners, we also work with organisations such as the Norfolk Wildlife Trust to ensure the nature reserves provide a safe haven for wildlife. We work on high-end domestic projects, such as this decking area in Cley. One of our most recent projects was a decking area for a home in the lovely village of Cley. The building had a great outlook on the hills overlooking the sea and marshes but had very little outside living space. Working with the owner, we designed and built the decking area, including some beautiful looking steps to the garden. We also built the porch shown in the pictures. The challenge here was to matcha new construction to an old building. By using oak struts and a pantile roof, we were able to make the porch a real feature of the house, in keeping with its 19th century classical appearance. A horse arena, complete with tack room and food store was one of our latest equine projects. The entire brief was to clear the ground of rubble and undergrowth, build an arena with accompanying buildings and install a large mirror for training and teaching purposes. The owner wanted a flooring that would drain well and provide a soft but stable surface for the horses and ponies so we came up with a solution involving shredded carpet material. Working dogs need to have comfortable and well-maintained housing and we feel our latest projects are state-of-the-art. For the owner of a number of Siberian huskies we built a highly secure yard. The security level was important for two reasons: these are expensive dogs but they are also escape artists. For this reason the fencing was exceptionally high and we also made sure the fencing was dug deep into the ground to prevent burrowing. The kennels shown in the picture were designed for working labradors. We paid particular attention to the temperature of the kennels, making sure the dogs could stay cool in the summer and warm in the winter months. The kennels are designed for ease of cleaning and are also highly secure to prevent dog-knapping. This is just a snap-shot of our work. To discuss any agricultural, equine or domestic construction work give Jamie a call on 07766815830.